2017, the year when Donald Trump brought a ‘Muslim Ban’ into place which sent airports and countries around the world into chaos. Just days before the release of this ban, the Prime Minister Theresa May visited the US to meet with Trump. with many criticising her for ‘jumping in Trumps pocket’ all for the sake of a special relationship. The PM didn’t even condemn the travel ban after returning home and many now feel as though - with Brexit happening - that May is now going to follow suit and enforce strict immigrant laws to stop migrants from coming to the UK. Since November 2016, an exhibition has been on display at Manchester City Art Gallery that displays international photographers work that show Britain in a distinct and unique light. If border control was more restricted, would that put off artists from coming to the UK to display their work? - if they could even get in at all. Do people care about how Britain used to be or has the fast paced nature of the 21st Century kept us out of touch with our roots? How has Britain changed through the years? I spoke to the curator of the exhibit Kate Jesson to find out what she said to say on the matter and how the exhibit came to light. Curated by Martin Parr and hosted by the Manchester City Art Gallery - celebrating work of top leading photographers - Strange and Familiar is definitely an exhibit worth checking out. From the very beginning, involving Martin Parr in the exhibit was always a cornerstone idea as his work connotes Britishness. 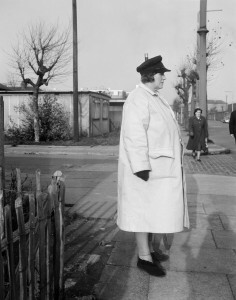 When Parr first started in the industry he was part of a society that “didn’t encourage creativity”, after a move of 2500 books from his persona home to a library in Bristol - where he is originally from - he realised that most photographers commissioned for work at the time were from foreign countries. We walked around the many pieces on display and Kate explained how different international artists see things in a way we just wouldn’t and what made their images powerful enough to be chosen. Henri Cartier-Bresson, Frances’ Eye of the Century, extracts an uncanny beauty from the modern world along with a unique blend or realist reportage. He made it big in 1952 after publishing the book, The Decisive Moment. His photographs in this exhibit focus on crowds and tend to stray from the ‘main event’. He was commissioned by Vogue for the feature titled Summer in Blackpool. Paul Strand was well known for having connections to the communist party and in 1949 he left the US to move to France where he started photographing rural life, he believed photography could be a force for good change. In 1954 Strand spent many months in Scotland and his photos of the Hebridean landscape reflect the islands in a still and brooding nature. His portraits are seen as stark, simple and yet have a heroic quality about them. Sergio Larrain is a self taught Chilean photographer and bought his first camera in the US in 1949. 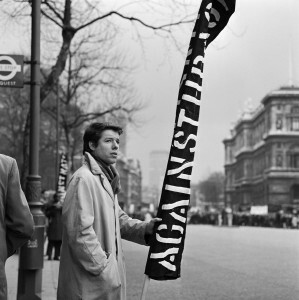 He spent four months in London in 1958 where he took photos around Hyde Park. The growing popularity of privately owned cars, pubs and a focus on gambling give his work an expressive feel, something that back then was highly controversial.“My favourite artist of the ones on display is definitely Edith Tudor Heart. She left Austria during the rise of Fascism, she was taught as an artist but has always called herself a photo-journalist. I see a camera as a political tool in many ways and so did she. Sadly she destroyed most of her photos.” Kate also mentions has she views society now as a “society of extremes” reflected in topics like elections and the housing crisis of the country. As we walked around the exhibition more, Kate brought us back to my original point of international work on display here and what Brexit might mean for the art world. She tells me: “We have a long multicultural past here in England, journey back to the first wave of immigrants. Even when this exhibit was being installed there was news about the Calais refugee camps and nothing seemed to be happening in a good way. “The arts will suffer in the UK due to a lot of money and funding coming from the EU but I believe that it won’t stop the delivery of work and programmes from international artists to come here.” I guess that’s an each to their own statement. Such an exhibit like ‘Strange and Familiar’ is a great platform for all these conversations to be had, these photos weren’t commissioned to be in a gallery but for newspapers and magazines but here they are. Artists like Raymond Depardon never even had his work commissioned because his photos were seen as too bleak. The media has such control and a lot of us don’t see it, I feel as though fear is used a lot and nowadays there aren’t enough critical writers. I sensed she was gesturing to me, the new wave of journalists, to not hold back and tell it like it is. Manchester is a new industry and we can showcase work from everywhere, we just need to not have fear and to answer all my previous questions, people like Kate do care, we should keep in touch with our roots whilst being opened minded and expressive. That’s what art is. 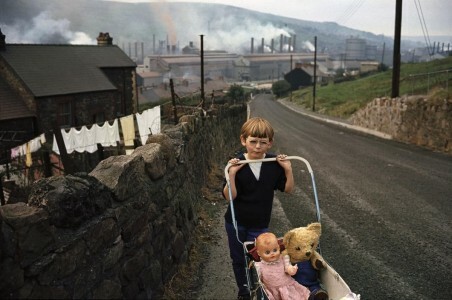 "Strange and Familiar: Britain as Revealed by International Photographers" runs at the Manchester City Art Gallery until May 29.